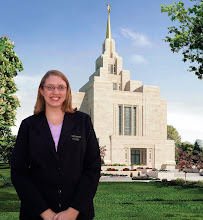 I got some bad news, a missionary wrote my teacher and told him that they are delaying the Kyiv Temple dedication till 2011. So I will not be there for that marvelous event. We also learned this week that we will be leaving on July 7th, which is a week earlier than I had planned! I am anxious to get out of the MTC, but I know I need a lot more preparation time. "Many young women are serving missions! Many are preparing to serve. Not because they are not married, but because they have a desire to serve. Therefore are called to the work! The reason so many are going is because in the next generation Heavenly Father will be sending His priesthood army to the earth and He wants to send them to mothers who have been properly trained and taught in the gospel! And what better training can a young woman have than that of serving a mission?!" I have never thought of the reason before why I have always had the desire to serve, so I think that is really amazing that a Prophet of the Lord said that! It gives me an extra boost of purpose for my mission, I love it! For the TRC tomorrow, we are going to pretend we are over at someone's house for dinner and we have to talk about foods we like and don't like and other dinner related phrases. In preparation for the TRC, our teachers told us all about Ukrainian food and how awesome it is! She left us all with our mouths drooling and stomachs grumbling! But, aside from that, we have to give the whole first lesson in Ukrainian for 35 minutes! I really do not feel prepared at all, I think tomorrow night will be the worst night so far! I don't think I've written yet about my branch presidency, I love them so much! President Callister was a mission president in Russia a few years ago, he even taught himself Russian- he is so wise, Brother Willkie was a Stake president for the students at BYU- he has eyes that search your soul and reflect the love of the Spirit, and Brother Waits has the funniest laugh and always a smile on his face. All of their wives are soo sweet to us and I can really tell that they care about us so much and really want to know what is going on in our lives. I just wanted to pay a small tribute to them because I greatly appreciate the love and support that they gave given me here. I hope to never forget them.